What a wonderful and fun night at the Royal Kubo in Clawson. Last night was the Karaoke Fundraiser- and what a huge success!!! There are so many people to thank, I am filled with gratitude beyond words. I know you are probably tired of me saying that - but it is true. God's goodness has truly filled me to overflowing - because of you! Many many thanks to the amazing people at the Kubo, especially John (aka Paul) for taking such good care of us. We had a great night of food, drinks, plenty of karaoke and dancing. Thank you to the Kubo for your incredible generosity. For letting us make ourselves at home, for all the extras, and for cutting us a break. As I think of ALL the amazing things that happened yesterday - I could blog for days. But, I will spare you, and just share a few of the wonderful things that happened. First of all, as of today I have exactly the amount needed to send me to Africa. It is an overwhelming feeling to know that God provides for us so well - through your generosity. It is truth that God loves and cares for us. When you step out in faith - God will more than meet your needs every time. First, I must thank my precious girls who have supported me from the beginning of the whole Mercy Ship adventure. Thank you Jordon, Liv, Kate & Kendra for pulling this whole karaoke night together. For the planning, logistics, decor, ideas, etc. We all know I could not have done this without you!!! Thank you for believing in me and for supporting me in so many ways. A BIG thank you to those of you who "worked" the event. No one worked the crowd better than MC Doug. With his cute hat and red tie - he was a true master of ceremonies and master of all rap songs that can be karaoked. Thank you to Kathy, Alli, Sarah, Tracy, Carrie & Virg for working the sign-in table, etc. Thank you Mark & Bart for all of your behind the scenes support. Also Alli & Dave for capturing all the great moments on camera. On second thought, once I see the pictures I might not be thanking you- but nevertheless I am grateful for capturing the memories. And a huge thank you to the people out at the Waterford Hills race track. What an amazing story - my brother surprising me by fundraising on my behalf at the race track where he races his mustang. Thank you to the amazing people out at Waterford Hills Racing who raised over $1,100.00 on my behalf. Most of these people I do not even know - but I cannot wait to meet you when I return in August. Go to this link http://waterfordhills.com/phpBB2/viewtopic.php?p=4866#4866 to read the post my brother put on the Waterford Hills bulletin board that stirred the generosity of so many. I am blessed beyonds words that God gave me you for a brother, Bob!! Also, there were two amazing stories of people coming all the way from Florida to join us at the Kubo last night. My parents friends Rose & Norm- I am proud to say they are now my friends as well. They live part time in Florida - and flew home early- changed their flight from Tuesday in order to be in town last night to be at the Kubo to surprise me. How amazing is that?? Who leaves Florida early to come to Michigan? Some wonderful people - that's who. And our beloved Kathy - who recently moved to Florida, but made it home to go camping with our small group and rock it out at the Kubo as well. Kathy thank you for coming home to us...even if it was just for a long weekend. Thank you for making this night very special by your presence. And I cannot forget my amazing co-workers...all my nurse friends from Beaumont. I LOVE that you guys came and partied down...and some husbands too! Ok, so someone paid to get us to stop singing- but what fun it was while it lasted. Thank you Linda for making MORE jewelry and selling it too - and for bringing friends with you! I know we were all tired at work this morning - but it was worth it. And a thank you also to the two guys sitting at the bar that were not a part of our "party". They contributed at least $20 to get some people to stop singing! The people of Africa thank you!!! I do want to thank EVERYONE that came out to the Kubo. What a great night of fun and celebration. I love that we could come together to have so much fun and that in doing so we are loving people on another continent. By sending me to Africa, you are a huge part of God's love displayed to the people I will meet and care for while in Liberia. It takes a community of people to make things happen and I am so grateful to God for you! Well, please stay tuned as I will post some pictures of the karaoke night - some pictures to surely make you laugh. WOW I am so proud!! God is so good! 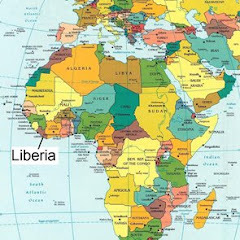 Watch out LIberia....someone that God really wants there is coming your way!! God is so good! Love you Jen! Good Morning. Jen, I am so proud of you, and your stand in the commmitment that you made so long ago. You are a testimony of what happens when we believe and walk in our commitments. AND Bob...what a honey of a brother. Also, I must add, the Karoake was a blast.